The Seven Principles Leader Training, based on The New York Times bestseller The Seven Principles for Making Marriage Work, was developed from Dr. Gottman’s four decades of research with more than 3,000 couples. Over the years, Drs. John and Julie Gottman have continued to fine-tune their innovative method of disrupting negative behaviors that send marriages onto the rocks. Showing partners how to work with the small daily moments that make up the heart and soul of any relationship, the Seven Principles Leader Training will train you how to teach couples proven, practical, and effective strategies for making marriage work. This training provides the tools and know-how to take small groups of couples through Dr. Gottman’s revised, groundbreaking book The Seven Principles for Making Marriage Work. Whether at your church, community center, place of business, or home, the material you learn in this training can be taught by anyone interested in making a difference in couples’ lives. What will I learn in the Seven Principles Leader Training? This training will prepare you to teach couples how to use Gottman Seven Principles Program materials. You will learn how to lead couples through The Seven Principles book, with a combination of lecture, multi-media presentations, interactive exercises, role-plays, and discussions. You will also learn how to teach couples lecture content by integrating research from The Seven Principles for Making Marriage Work, and how to educate couples through relationship enhancing exercises. If you plan on co-presenting workshops, bring your co-presenter and get trained together. Whether you have years of experience as a clinically trained therapist or are a layperson, this training will give you tools to facilitate a Gottman Seven Principles Program for couples in your community. What is the difference between the Seven Principles Program and The Art and Science of Love? While both workshops are based on the Gottman Method, there are some key differences. 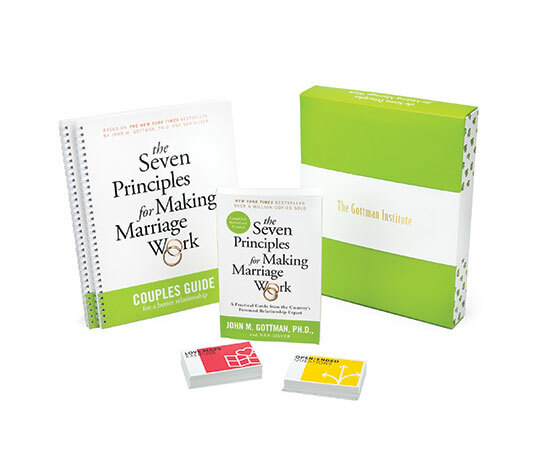 Please read The Seven Principles for Making Marriage Work book prior to attending the training. You will want working knowledge of the exercises and research in order to learn how to lead a class in your community. No, this training is intended for leaders who want to teach a class to couples. Many leaders choose to attend the training with their business partner so that they can teach the Seven Principles class as co-leaders. All registrations are final. If you are unable to attend this event, you may transfer your funds to a future training for an additional $50 administrative fee. To obtain a transfer, please notify us at least 21 days before the event. Within 21 days of the workshop, no transfers will be issued. Transfers will expire one year from the date of the notification, and cannot be transferred to another attendee. Presented by Laura Heck, LMFT and Dave Penner, Ph.D.